A PERFORMANCE NOT TO MISS. 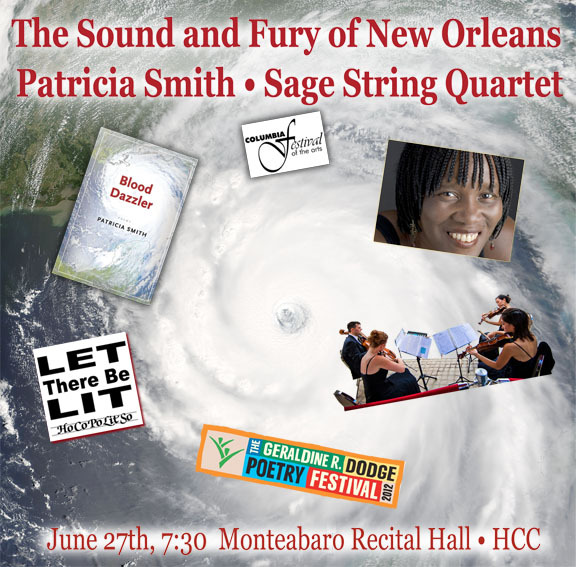 Straight from the world premiere of this performance at the Geraldine R. Dodge Poetry Festival, Patricia Smith recites poems from her collection Blood Dazzler in the voices of the people lost in the floods and fury of Hurricane Katrina accompanied by the rich, spicy music of Wynton Marsalis played by Sage String Quartet. Marsalis’ At the Octoroon Balls is a dramatic gumbo of jazz, blues, Americana and European classical music. This entry was posted in Event, Poetry and tagged Blood Dazzler, Columbia Festival of The Arts, Dodge Poetry Festival, HoCoPoLitSo, Octoroon Balls, Patricia Smith, Sage String Quartet, Wynton Marsalis. Bookmark the permalink.